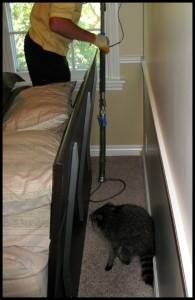 Raccoons on your property or in your home almost always spells trouble. From digging through garbage cans, chewing on and destroying insulation, and tearing holes in walls, raccoons can cause some serious headaches for homeowners. Contrary to their cute appearance, raccoons are aggressive and known to carry rabies which is why we recommend calling a professional if you catch one on your property. Critter Control of Dallas is fully equipped to handle any raccoon control problems, and we possess the knowledge to do so humanely and safely. A number of our clients have even reported some success using repellants. Raccoons are very territorial, and if they are in search of a new territory then the smell of a repellant may deter them from claiming your property as theirs. Repellants are only effective as a preemptive measure, because if a raccoon has already made their way onto your property, a simple smell won’t drive them away. Our raccoon control methods are the most humane and effective available anywhere, and our expert staff will rid you of any infestation and help ensure it never returns. Give us a call today at 817-222-1101 or fill out a Contact Us form for your free estimate.